The founder of TM, Mahesh Prasad Warma, later known as Maharishi Mahesh Yogi, was born in India around 1910. After graduating from Allahabad University in 1942 with a degree in physics, Mahesh became the disciple of the Indian religious leader Guru Dev. It was Guru Dev who instructed Maharishi to devise a meditation technique from the Vedas (part of the Hindu scripture). The Maharishi (as he is referred to) was devoted to fulfilling the plan of Guru Dev in bringing his teachings to the world. In 1958 Maharishi founded the Spiritual Regeneration Movement in India. He came to America the following year and set up his organization while spreading the gospel of Guru Dev. Today, several million people in the United States and around the world have been taught the Maharishi's meditation techniques, said to be nonreligious, although thoroughly Hindu. How would you like to have your health improved, your self-image and productivity increased, and your intelligence and creativity heightened without stress or tension? According to its advertisements, these are some of the ways TM will benefit individuals. Allegedly all this can be done within any religious or nonreligious system since TM supposedly has no religious basis. Moreover, TM has developed some very admirable goals to accomplish this in the lives of people by setting up nationwide centers. Under a World Plan, 350 teaching centers of the Science of Creative Intelligence have been founded in the largest cities throughout the United States and the world. In fact, resolutions drawn up by the Maharishi and promoting TM have been adopted by legislatures throughout the country. TM can appeal to all segments of society, including the famous (such as the Beatles in the mid-60's), the counter-culture, the business community and the intelligentsia. Stanford law professor John Kaplan testifies, "I use it the way Id use a product of our technology to overcome nervous tension. It's a non-chemical tranquilizer with no unpleasant side effects" (Time Magazine, October 30, 1975). TM, however, is not a neutral discipline that can be practiced without harm to the individual. In actuality, TM is a Hindu meditation technique that attempts to unite the meditator with Brahman, the Hindu concept of God. Despite claims to the contrary, TM is religious in nature. The following is a translation of the Puja, the initiation ceremony read in Sanskrit by the TM instructor. To Lord Narayana, to lotus-born Brahma the Creator, to Vashishta, to Shakti, and to his son, Parashar, to Vyasa, to Shukadava, to the great Gaudapada, to Govinda, ruler among yogies, to his disciple, Shri Trotika and Varttika-Kara, to others, to the tradition of our masters I bow down. To the abode of the wisdom of the Shrutis, Smritis and Puranas, to the abode of kindness, to the personified glory of the Lord, to Shankara, emancipator of the Lord, I bow down. To Sharkaracharya, the redeemer, hailed as Krishna and Badarayana, to the commentator of the Brahma Sutras, I bow down again and again. At whose door the whole galaxy of gods pray for perfection day and night, adorned with immeasurable glory, perceptor of the whole world, having bowed down to him, we gain fulfillment. Skilled in dispelling the cloud of ignorance of the people, the gentle emancipator, Bramananda Saraswati -the supreme teacher, full of brilliance, him I bring to my awareness. Offering rice to the lotus feet of Shri Guru Dev, I bow down. Offering a flower to the lotus feet of Shri Guru Dev, I bow down. Offering incense to the lotus feet of Shri Guru Dev, I bow down. Offering light to the lotus feet of Shri Guru Dev, I bow down. Offering water to the lotus feet of Shri Guru Dev, I bow down. Offering fruits to the lotus feet of Shri Guru Dev, I bow down. Offering water to the lotus feet of Shri Guru Dev, I bow down. Offering betel leaf to the lotus feet of Shri Guru Dev, I bow down. Offering coconut to the lotus feet of Shri Guru Dev, I bow down. White as camphor, kindness incarnate, the essence of creation, garlanded with Brahman, ever dwelling in the lotus of my heart, the creative impulse of cosmic life, to that in the form of Guru Dev, I bow down. Offering camphor light to the lotus feet of Shri Guru Dev, I bow down. Offering water to the lotus feet of Shri Guru Dev, I bow down. Offering a handful of flowers. From the translation of the Puja, the religious nature of TM can clearly be seen. 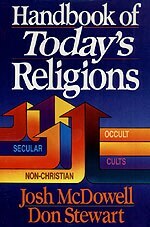 In 1977, a New Jersey federal court barred the teaching of TM in the schools of that state, the presiding judge concluding, "The teaching of SCI/TM and the Puja are religious in nature; no other inference is permissible or reasonable ... although defendants have submitted well over 1500 pages of briefs, affidavits and deposition testimony in opposing plaintiffs' motion for summary judgment, defendants have failed to raise the slightest doubt as to the facts or as to the religious nature of the teaching of the Science of Creative Intelligence and the Puja. The teachings of SCI/TM courses in New Jersey violates the establishment clause of the First Amendment, and its teaching must be enjoined" (United States District Court, District of New Jersey, Civil Action No. 76-341). Therefore the claim of the Maharishi and his followers as to the non-religious basis of TM has no basis in fact. "The TM program has no adverse side effects and can promote what pills cannot-natural psychological growth" (Harold Bloomfield, meditator and psychiatrist, Discovering Inner Energy and Overcoming Stress, p. 149). There are, however, some authorities that would disagree with Bloomfield's statement. That the dangers of meditation are considerable among the immature appear to be overlooked by these (TM) enthusiasts who regard meditation as a universal panacea (Una Kroll, M.D., London Times, June 30, 1973). There are risks in cultivating altered states of consciousness. One of these risks ... may be a permanent alienation from ordinary human attachments (Elsa First, child psychotherapist, Frontiers of Consciousness, p. 65, John White, ed.). As a person enters or is in an ASC (altered state of consciousness), he often experiences fear of losing his grip on reality, and losing his self-control (Arnold M. Ludwig, Altered States of Consciousness, p. 16, Charles Tart, ed.). There has not been and there will not be a place for the unfit. The fit will lead, and if the unfit are not coming along, there is no place for them. In the place where light dominates there is no place for darkness. In the age of Enlightenment there is no place for ignorant people. the ignorant will be made enlightened by a few orderly, enlightened people moving around. Nature will not allow ignorance to prevail. It just cant. Nonexistence of the unfit has been the law of nature (Maharishi, Inauguration of the Dawn of the Age of Enlightenment, MIU Press, p. 47). The Science of Creative Intelligence structures all knowledge in the awareness of everyone and thereby makes everyone infallible (ibid., p. 49). It is only childish and ridiculous to base one's life on the level of thinking. Thinking can never be a profound basis of living. Being is the natural basis ... thinking, on the other hand, is only imaginary (Maharishi, Transcendental Meditation, p.99). It is disturbing to think that Maharishi would eliminate opposers and that thinking is useless! The Bible says that judgment belongs only to the Lord Jesus Christ (John 5:22, 27) and that one should examine and test all things by God's Word (1 John 4:1). We have already observed that TM is religious in nature, based upon Hinduism, consequently their theology is in direct contrast to Christianity. The Maharishi's view of God reflects a denial of the infinite-personal God revealed in Scripture. He writes, "God is found in two phases of reality: as a supreme being of absolute, eternal nature and as a personal God at the highest level of phenomenal creation!' (Science of Being and Art of Living, Maharishi Mahesh Yogi, Rev. Ed. 1967, p. 271). "God, the supreme almighty being, in whose person the process of evolution finds its fulfillment, is on the top level of creation!' (Maharishi Mahesh Yogi, Transcendental Meditation, p. 270). "He (God) maintains the entire field of evolution and the different lives of innumerable beings in the whole cosmos" (ibid, p. 271). Maharishi's view of God and man is not in accord with the Bible. Scripture teaches that God is infinite while man is finite. Man can never become God or attain Godhood for he is part of God's creation. Man is the creature. God is the creator. Although man is part of God's creation, he is not to be identified with God. God, the creator, is a being separate from His creation. God is by nature eternal, whereas God's creation is temporal (it came into being at a particular time). Man, the finite, will never become God, the infinite. The Maharishi does not have much to say about Jesus but when he does, he contradicts the Bible. Due to not understanding the life of Christ and not understanding the message of Christ, I dont think Christ ever suffered or Christ could suffer ... It's a pity that Christ is talked of in terms of suffering ... Those who count upon the suffering, it is a wrong interpretation of the life of Christ and the message of Christ ... How could suffering be associated with the One who has been all joy, all bliss, who claims all that? It's only the misunderstanding of the life of Christ (Maharishi Mahesh Yogi, Meditations of Mahanshi Mahesh Yogi, pp. 123-124). It is the Maharishi who misunderstands the purpose of Christ's coming, which was to die for the sins of the world. "The next day he saw Jesus coming to him, and said, Behold, the Lamb of God who takes away the sin of the world!" (John 1:29 NASB), and "Just as the Son of man did not come to be served, but to serve, and to give His life a ransom for many" (Matthew 20:28 NASB). Jesus Christ, contrary to the teaching of the Maharishi, suffered on the cross for our sins so we might receive forgiveness from God for our sins. His suffering was real. Blessed is the man that walketh not in the counsel of the ungodly, nor standeth in the way of sinners, nor sitteth in the seat of the scornful. But his delight is in the law of the LORD; and in his law doth he meditate day and night. And he shall be like a tree planted by the rivers of water, that bringeth forth his fruit in his season; his leaf also shall not wither; and whatsoever he doeth shall prosper. The ungodly are not so: but are like chaff which the wind driveth away. Therefore the ungodly shall not stand in the judgment, nor sinners in the congregation of the righteous. For the LORD knoweth the way of the righteous: but the way of the ungodly shall perish (Psalm 1:1-6). Transcendental Meditation -Hindu religious sect founded by Maharishi Mahesh Yogi under the guise of the supposedly nonreligious Science of Creative Intelligence. Promises to expand one's awareness and creativity. American Foundation for the Science of Creative Intelligence -One branch of TM organization. Guru Dev-The late Hindu Swami (religious master) who was the teacher of Maharishi Mahesh Yogi, the founder of TM. Dev is addressed as deity in the TM initiation ceremony. International Meditation Society- One branch of TM organization. Maharishi Mahesh Yogi-The founder of Transcendental Meditation (TM). Mantra-In Hinduism, a sacred word which embodies through some specific supernatural and spiritual power. Also used as the meditative words in TM. Prana -In TM, it is the internal force within God by which He creates. Puja -In TM, a written portion of the initiation ceremony read in Sanskrit by the instructor. It is a collection of prayers to Hindu deities. Sanatana dharma -A Hindu term, referring to Hinduism as the eternal system, the one true religion. Students International Meditation Society- Pseudonym for TM organization. Vedas-The collection of Hindu sacred scriptures. Yoga -According to Hinduism, an exercise (physical, mental, or spiritual) designed to aid in one's progress to God-realization.